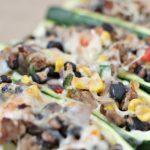 Weight Watchers Taco Zucchini Boats are a filling meal or appetizer recipe. These only have 2 Freestyle SmartPoints each and if you chose to leave the cheese off they are zero points. Start by dicing the onion, red bell pepper, and jalapenos into very small pieces. Scoop out the insides of the zucchini with a spoon. Brown the ground turkey and add in diced vegetables, black beans, corn, pepper, garlic, and onion powder. Spoon mixture into each zucchini equally. Remove foil, and add 1/4 cup shredded cheese to each boat. Each zucchini boat is 2 Freestyle SmartPoints for WW. If you leave the cheese off these are Zero Points.